Several folks have asked “What is the best way to order poster collages from the website?” So, I thought I would put together a couple of options. 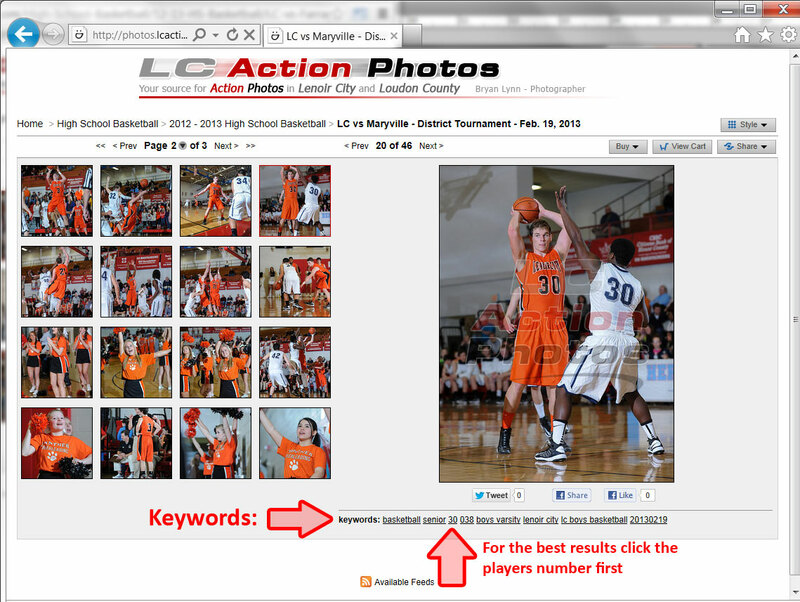 I have also included a way to help you find pictures of specific individuals based on their jersey number. Each picture in the system has its own unique filename. Sending a link to the image you want is the most accurate way to indicate which files you want but it takes a few more minutes. Below are some screen shot to demonstrate how to make this work. 1. 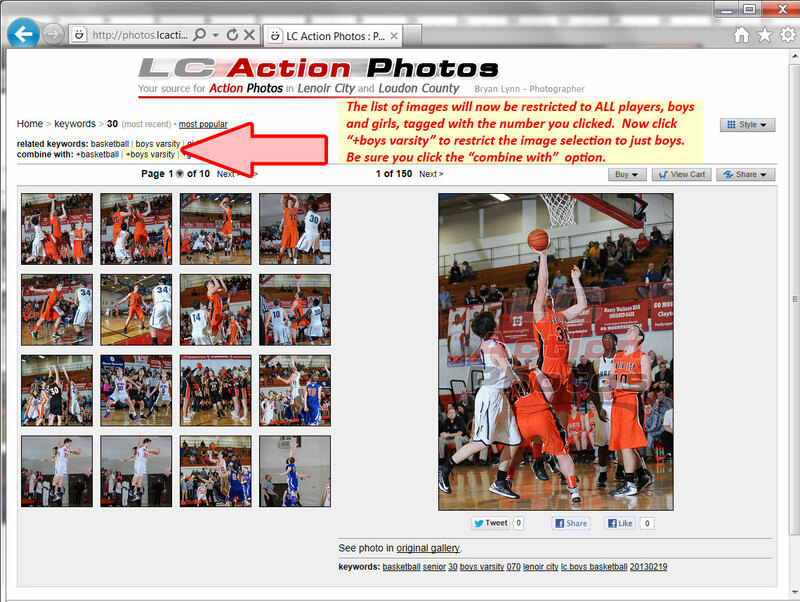 Once you find the picture you want click the “Share” button in the upper right hand corner. When the menu drops down click the “Get a Link” option. This will send you to another view where you can copy the link. 3. 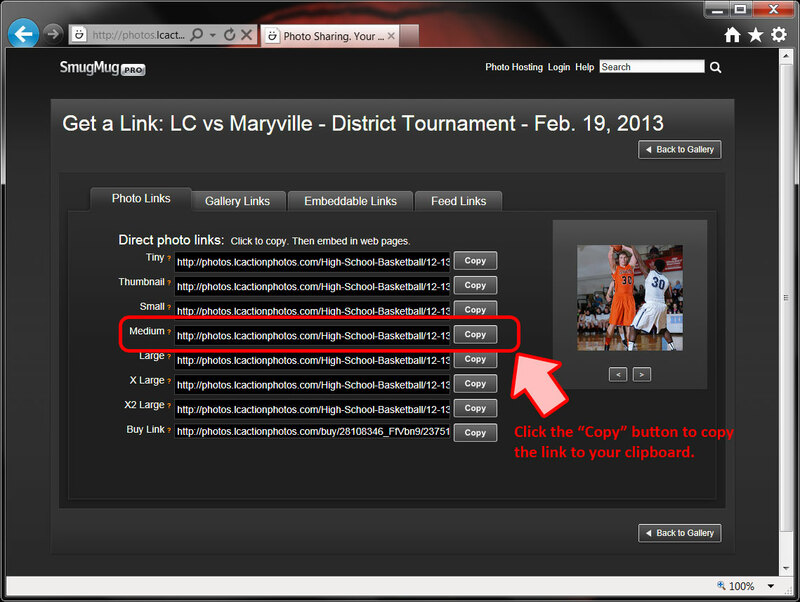 Once you click the “Copy” button the link will be saved to your clipboard. 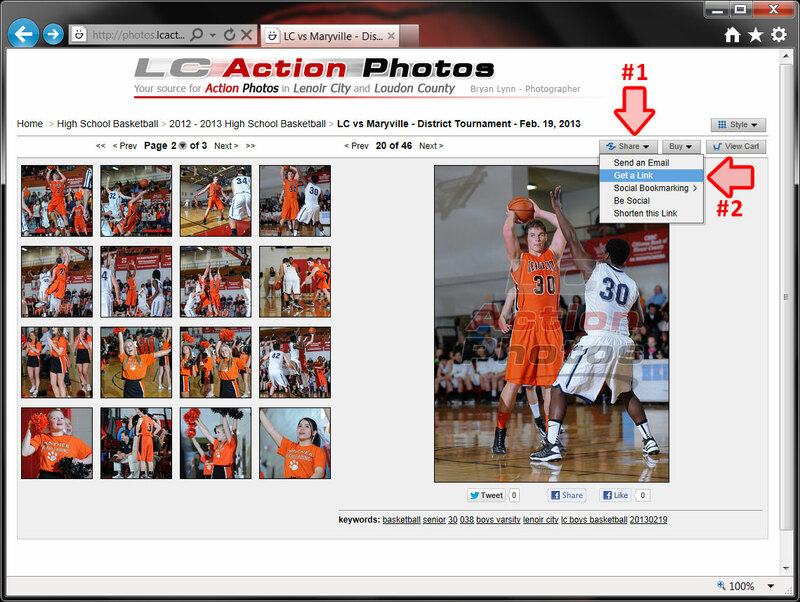 Simply paste the link into an email addressed to photos@LCActionPhotos.com. You should put links to all of the images you want into one email. If you are not familiar with the paste function, it can typically be found under the “Edit” menu option in most email programs. Once you click a keyword, you will leave the gallery (e.g. 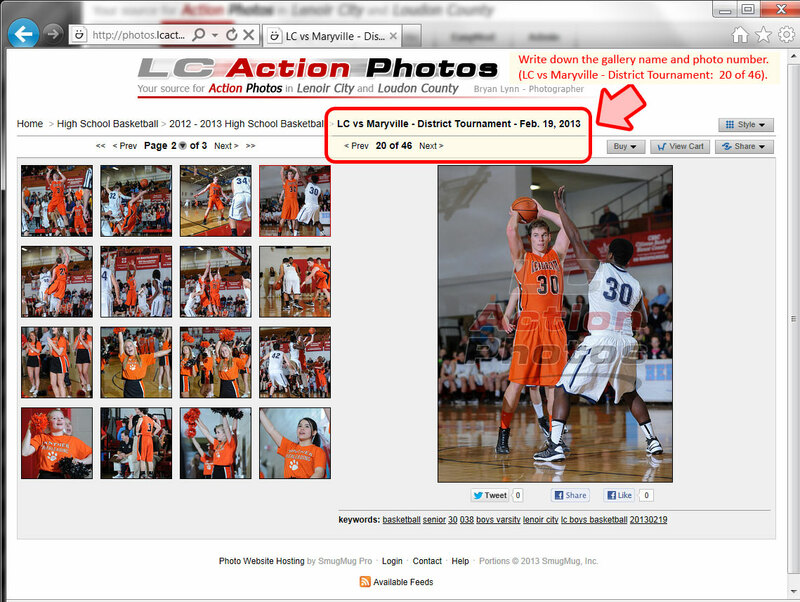 LC vs Maryville) and you will see ALL the photos in the sub-category (e.g. 2012-2013 High School Basketball) that have been flagged with a “30”. This will contain both boys and girls as well as players from other teams. At this point you can combine you initial keyword search with another word. In our example, we will use “boys varsity”. Below is a screen shot before we combine the two keywords. You should now have a list of pictures of #30 from all games in that sub-category. Now, I must confess that sometimes I forget to tag them before I run the upload process. In fact I didn’t know tagging was even possible until 2012, so no images before 2012 are tagged. 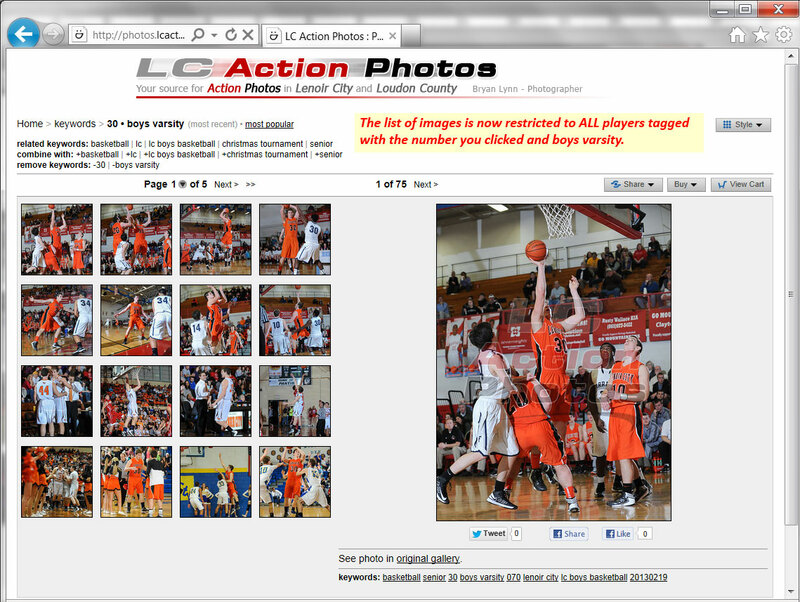 And basketball images are more likely to be tagged that football images. With that in mind, if you are having problems finding enough images for a poster, you may want to search through all the galleries to see if there are images that haven’t been tagged. If you are using this method to find pictures, you MUST use Option #2 described above to send me the list of photos that you want. If you are having problems finding images or problems navigating the website and galleries please call and I will be glad to help you out.